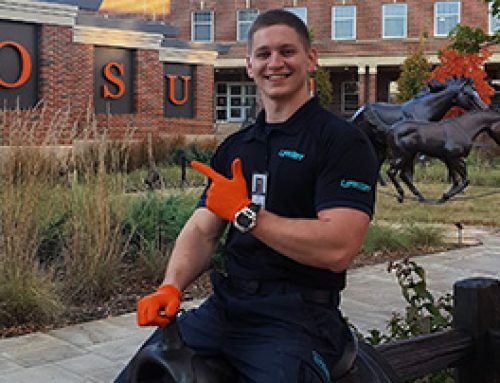 Last year, LifeNet’s Stillwater, Oklahoma Division responded to dozens of flu-related 911 calls throughout Payne County. In an effort to mitigate the number of flu-related calls this year, LifeNet recently setup a mobile, “no-cost”, flu vaccine clinic for area senior living facilities. “Last year we discovered many people we transported with flu like symptoms had never received a flu vaccination. Our Senior Operations Manager, Matt Williams, came up with the idea to hold on-site flu vaccination clinics at area senior living facilities to make it easier for people living in these facilities to get a flu shot this year,” said Kelly McCauley, General Manager for LifeNet in Stillwater. Last year, Oklahoma was one of seven states who was hit with a high number of people contracting the flu early in the flu season. This year, the flu is already showing up across the state. Since September 1st, 27 Oklahomans have been hospitalized by the flu. The Centers for Disease Control (CDC) recommends people receive flu vaccinations by the end of October because the vaccine can take up to two weeks to build the body’s immune system. Flu season will run through May 2019, but peak season is typically November thru February. In addition to getting a flu shot, there are several things you can do to help protect yourself and others from the flu this year. According to the CDC, an estimated 80,000 Americans died from flu related complications last year. LifeNet is hoping to lower that number in Oklahoma by offering “no-cost” mobile clinics. To schedule a mobile flu vaccine clinic, call 405-707-0007 or email mrwilliams@lifenetems.org.